Hyundai Verna is equipped with features such as ventilated front seats, cruise control, sliding front armrest and rear centre armrest, USB chargers at the front and rear, sunroof and rear air-conditioning vents. Hyundai verna versus Volkswagen Vento. The new-gen Hyundai Verna is all set to be launched in India on August 22, 2017, and this new iteration of the sedan will see a host of updates in terms of design, styling and feature list and it will compete Volkswagen Vento model which was launched earlier this year. Let's have a look at specifications of both models to decide which one is a perfect grab. The Highline Plus trim will be offered on all engine variants of Vento, which are the 1.2 Litre TSI petrol, 1.6 Litre MPI petrol and the 1.5 Litre TDI diesel as well and Hyundai Verna will available with two engine options - a 1.6-litre petrol and a 1.6-litre diesel. The petrol motor produces 121bhp and 151Nm of torque, whereas the diesel engine churns out 126bhp and 260Nm of torque. Both the engines are coupled to a 6-speed manual or a 6-speed automatic gearbox. Volkswagen has also given subtle updates inside the cabin such as AC vents for rear passengers, auto dimming rear-view mirror, automatic rain-sensing wipers and a cooled glove-box as well. Other things such as the upholstery and infotainment system remain the same. Volkswagen reiterated that all its Vento models get ABS and airbags as standard fitment. However, Hyundai Verna is equipped with features such as ventilated front seats, cruise control, sliding front armrest and rear centre armrest, USB chargers at the front and rear, sunroof and rear air-conditioning vents. However, the Vento Highline Plus gets more features which include LED headlamps, LED DRLs and a rear-view camera as well. The new car is as much as 15mm longer and 29mm wider than the outgoing model. The wheelbase is longer by a full 10 mm. All this has translated into an airier cabin with more space for passengers. The boot space is higher by 16-litres. 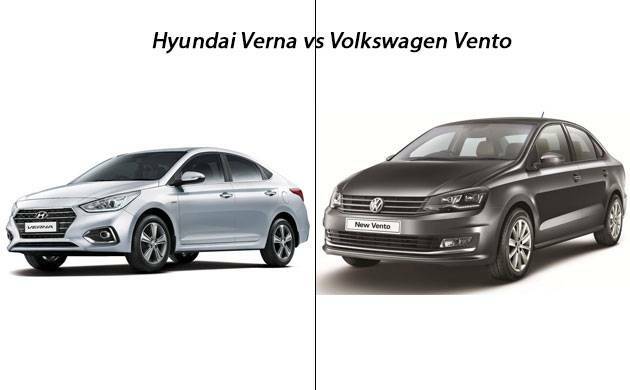 In terms of price, Hyundai Verna is little expensive than Volkswagen Vento. Hyundai Verna will cost around Rs 8.81 lakh and Volkswagen Vento priced at Rs 9.2 lakh. For all the latest Auto News Download the News Nation App available on Android and iOS.